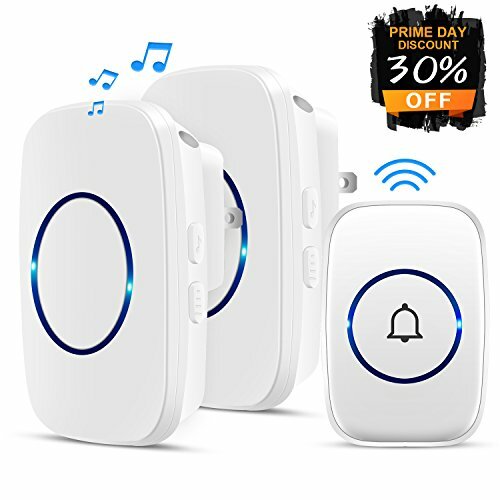 This doorbell chime kit provides strong signal penetration,ensures you'll never miss any important visit or urgent deliveries with the help of the doorbell even if the receiver is installed on another floor. but also suitable to use in factories, offices, apartment blocks, villas as well as emergency contact for the elderly, pregnant women, patient etc. A wide selection of 38 melodies means there is enough choice for a new tune every week of the year. It is easy to choose your favorite by simply using the Next and Previous buttons. There are 3 adjustable volume levels that range from 20 to 80 db, ensuring that even the elderly can hear the bell. Remote transmitter button(battery included) can be fixed at the door frame with the attached adhesive tapes or screws,which are included in the package. The impressive IP44 dustproof and waterproof rating makes the transmitter tough enough to withstand various outdoor environments. And with a working temperature ranging from -4 °F to 140° F, the transmitter can work for you in even the harshest weather conditions.